Encyclopedia … combined with a great Buyer's Guide! Note: this box searches only for keywords in the titles. For full-text searches, use our search page. Sorry, we don't have an article for that keyword! The RP Photonics Buyer's Guide contains 7 suppliers for single-crystal fibers. You are not yet listed? Get your entry! Single-crystal fibers are long and thin rods of monocrystalline material, usually having a diameter below 1 mm (in extreme cases even only a few microns) and a length between 10 cm and several meters. Mostly due to their geometry, they are called fibers, although many of them are not sufficiently thin and stable to allow substantial bending. This article focuses on fiber for optical applications; there are also mechanical applications, for example suspensions with low thermal noise for highly sensitivity interferometers. Although work on single-crystal fibers has been done over many years, much of it is still at the research state, i.e., not yet widely applied in laser technology. Single-crystal fibers are not to be confused with photonic crystal fibers, which usually consist of glass or polymers. Laser-heated pedestal growth is applicable to many materials. The most common fabrication method for such devices is laser-heated pedestal growth (LHPG): the tip of a monocrystalline rod is heated with a laser (usually a CO2 laser) and slowly pulled upward (e.g. with a few millimeters per minute), where it soon becomes solid again. The diameter of the obtained fiber is typically about three times smaller than that of the source crystal. The molten zone (float zone) is hold together by surface tension rather than by contact with the crucible, so that contamination with impurities is avoided. A fiber length of e.g. 1 m or more can be produced, but unfortunately that growth method is rather slow (far slower than drawing glass fibers), and only a single crystal fiber can be grown at a time with the used apparatus. It is also sensitive to disturbances e.g. from air flow, vibrations or laser power fluctuations, which can easily cause irregularities at the surface. The method can utilize not only single crystal source materials (e.g. oxides and semiconductors), but also polycrystalline materials and even pressed or sintered powder. Besides laser heating, one can use other methods of heating, e.g. induction heating in case of semiconductors. An alternative method for faster growth is edge-defined film-fed growth (EFG). Here, the growth material is supplied through one or several capillaries e.g. in a molybdenum die, the diameter of which essentially determines the obtained fiber diameter. Compared with laser-heated growth, film-fed growth can be more easily used for growing multiple fibers at the same time, but has the disadvantage of contaminating the fibers with material from the die. A variant of the film-fed growth is the micro-pulling-down (μ-PD) method, where the crystal is pulled downwards. As in the conventional film-fed growth method, the molten fresh material is supplied through a thin channel into the growth zone. Sapphire (Al2O3) is a particularly hard material with high thermal conductivity, exhibiting a wide transparency region ranging up to 3.2 μm (i.e., far more into the infrared than silica). It can be doped with Ti3+ ions to obtain very broadband laser crystals (→ titanium-sapphire lasers). YAG (Y3Al5O12) is also quite hard and can well be doped with many rare-earth gain materials. Due to its cubic crystal structure, its crystal orientation does not matter for most purposes. There are various other oxides, e.g. other garnet crystal materials such as GGG (Gd3Ga5O12), having somewhat similar properties as YAG, also spinel (MgAl2O4). Some fluoride crystals (e.g. LiF) have a very wide spectral transmission range. Nonlinear crystal materials like lithium niobate (LiNbO3) can also be used, e.g. for optical parametric amplifiers. Semiconductors like silicon (Si), germanium (Ge) or silicon–germanium (SiGe) exhibit transmission in the infrared with strong optical χ(3) nonlinearities. As mentioned above, many single-crystal fibers can be used as laser-active (amplifying) devices when they are doped e.g. with rare-earth ions like Yb3+, Nd3+, Er3+ or Tm3+, or with transition metal ions like Ti3+. Single-crystal fibers are similar to common optical glass fibers in terms of their geometrical shape (long, thin and cylindrical) and to some extent concerning their fabrication (pulling from a thicker source block, a preform). Most single-crystal fibers do not contain a core–cladding structure! Such structures are difficult to fabricate. On the other hand, in contrast to real fibers they usually do not contain a fiber core; multimode waveguiding can be achieved only based on the strong refractive index contrast at the crystal–air interface. A cladding layer with a slightly lower refractive index around a core glass would help to reduce the propagation losses and possibly to allow for single-mode guidance, but is difficult to fabricate ; some dip coating techniques and other techniques are applied only in rare cases [14, 19]. For high-power operation, there is also a contribution of thermal lensing, which can substantially affect the mode structure. Furthermore, a substantial approximately parabolic index profile can occur e.g. due to inhomogeneity of the doping profile and possibly thermal stress during fabrication . Compared with optical glass fibers, single-crystal fibers allow only very limited bending. They are operated with a far larger effective mode area, so that the optical intensities for given optical power level are much lower, and material nonlinearities have a much lower effect. Also, the optical damage threshold is correspondingly higher. For these reasons, single-crystal fibers are suitable for far higher power levels, particularly in the domain of ultrashort pulse amplification. On the other hand, it is tentatively more difficult to obtain a high output beam quality due to the inherent multimode nature. The other essential difference is the use of monocrystalline rather than amorphous material. Consequences of that are that one can often achieve much higher doping concentrations of laser-active ions, and the absorption and emission spectra of rare-earth ions normally exhibit a substantially smaller bandwidth in crystalline materials. The small bandwidth also implies higher transition cross sections, resulting in stronger pump absorption, higher gain and lower gain saturation fluences and intensities. Increased propagation losses are not necessarily a problem for applications. Propagation losses in single-crystal fibers are usually substantially higher than in the corresponding bulk materials (or in glass fibers), mostly due to scattering losses at the surface, which exhibits surface defects like growth stripes and has a very strong refractive index contrast (far higher than for the core–cladding interface of a regular fiber). However, they can be well below 1 dB/m or even below 0.1 dB/m, so that they do not seriously reduce the power efficiency of the devices. Many of the used materials exhibit good infrared transmission. The used materials often have a good infrared transmission range, so that sometimes they can be an alternative to mid-infrared fibers based on glasses or polycrystalline material – for example, for transmitting the outputs of Er:YAG lasers at 2.9 μm. Compared to mid-IR fibers, they may allow to transmit much higher optical powers with lower optical power losses. However, they usually cannot be used at similarly long wavelengths as some infrared fibers. Compared with usual laser crystals, single-crystal fibers offer a far higher propagation length, so that correspondingly higher optical gain can can be achieved – e.g. 20 dB or even more. Despite the long length and relatively small beam diameter, no extraordinarily high pump beam quality is required, since the waveguiding effect from the crystal–air interface can be exploited (although at the cost of increased scattering losses). Click here to send us your feedback! Found any errors? Suggestions for improvements? Do you know a better web page on this topic? If you want a response, you may leave your e-mail address in the comments field, or directly send an e-mail. If you enter any personal data, this implies that you agree with storing it; we will use it only for the purpose of improving our website and possibly giving you a response; see also our declaration of data privacy. If you like our website, you may also want to get our newsletters! 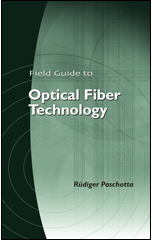 Note that we have also published a free tutorial on fiber optics!